I've been wanting to make this nutty and tangy saffron flavored lamb stew for a long time. You must try this gorgeous, flavorful and aromatic stew -- you will be very pleased with the taste. 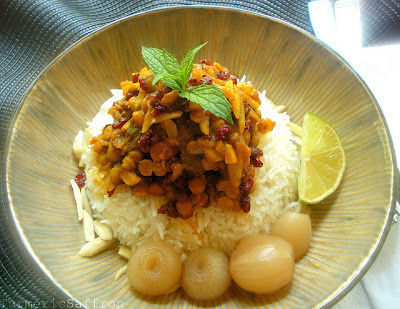 I generally use barberries to make the rice with barberries dish (zereshk polow), which has been a staple in our family, but another great use is to make this delicious stew with it. Barberries/Berberis (Zereshk) is widely grown in the north eastern part of Iran, in the region of Khorasan. 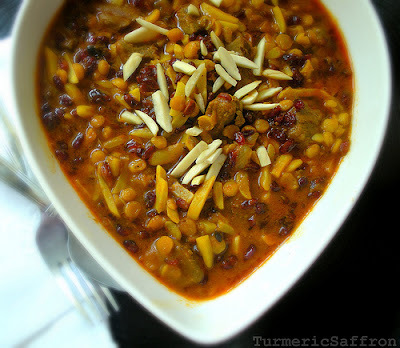 I like خورش خلال بادام khalal badam stew to be filled with slivered almonds and barberries. The more common version of this stew is usually made without any yellow split peas but I like the addition of its flavor. If you prefer a thinner khoresh you may omit or the yellow split peas. In a small frying pan lightly saute the barberries in 1-2 tablespoons of oil over medium heat for a few minutes. Set aside. In a small pan saute the tomato paste in a tablespoon of oil for 2-3 minutes over medium heat. Set aside. This step is optional but it improves the taste of the stew. Heat 2-3 tablespoons of oil in a large pot, saute the sliced onion over medium heat until translucent, add the garlic and saute for another 2-3 minutes then add the turmeric. Stir well to blend every bit of onion and garlic with turmeric powder. Add the meat and brown on all sides. Add cinnamon, salt and pepper to taste, blend well. Make some room in the center of the pot by pushing the meat and onion mixture to the side of the pot and place the split peas in the center and fry them for a few minutes. This will harden the peas and gets rid of their raw smell. You may also cook the split peas separately with two cups of water and add them to the stew half way through cooking if you prefer. Scoop in the tomato paste and pour in enough water to cover meat and to come about two inches above. Cover and cook for 30 minutes on medium to low heat, add the almond slivers, mix well, cook and cover for another 20 minutes. Add water if needed. Add barberries and saffron, stir well, taste and adjust seasoning. Cook for another 20-30 minutes until meat is tender and the flavors are well blended. Pour rose water in the last 10 minutes of cooking. Serve warm with rice, pickles (torshi), fresh herbs and yogurt. 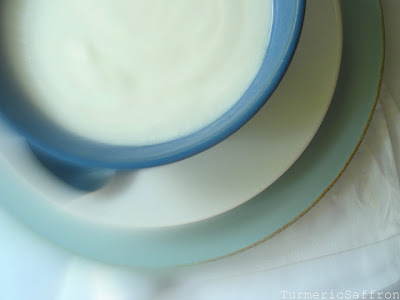 Homemade yogurt is refreshing and healthy. 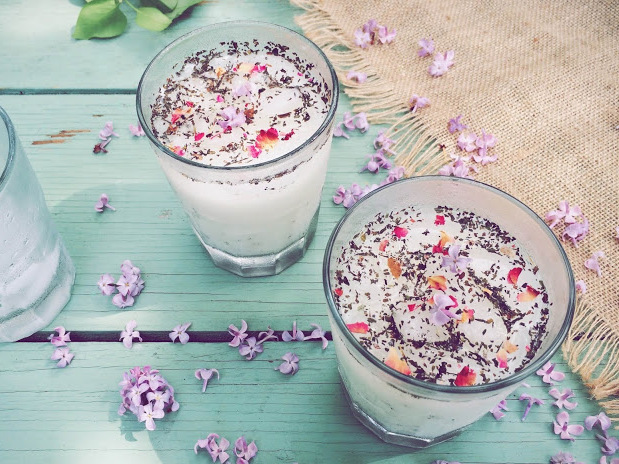 Yogurt is so versatile and is used in many Persian recipes and is usually served as a side dish for lunch and dinner. Making homemade ماست yogurt is easy and while the whole process does take some time it is usually ready by the next day. You can use any kind of milk available. I like to use reduced-fat (2%) milk. You can use a few tablespoons of the store-bought plain yogurt if this is the first time you're making your own yogurt. Save and put aside some of this yogurt for the next batch of yogurt you make. Also, it's helpful to have a thermometer. Since I bought a candy thermometer a while back, I no longer use the old-fashioned method of using the tip of my finger to tell if the milk is at the right temperature before adding the yogurt. Pour the milk into a large heavy-bottomed pot over medium to low heat, stirring frequently to avoid the scorching. Place a candy thermometer on the side of the pot. Milk is heated till it reaches 185-190 degrees Fahrenheit. Remove from heat and let it cool down to 110-112 degrees Fahrenheit. Place the yogurt (with live culture) in the container that you will be storing it in. Pour a cup of milk over the yogurt and stir well. Slowly add the remaining warm milk and stir. If you are making the yogurt in the same pot that you were boiling the milk then add a cup of milk to the yogurt, stir and gently add the mix to the pot and stir well. Cover the container or the pot tightly, wrap it with kitchen cloth and store in a warm place. It should be left untouched for up to seven hours for the yogurt to ferment till it sets. Refrigerate the yogurt overnight or for at least 8 hours. Serve cool, plain or combined with chopped Persian cucumbers or steamed spinach. دوغ Doogh is a popular refreshing drink in Iran that is made with yogurt, water and salt. 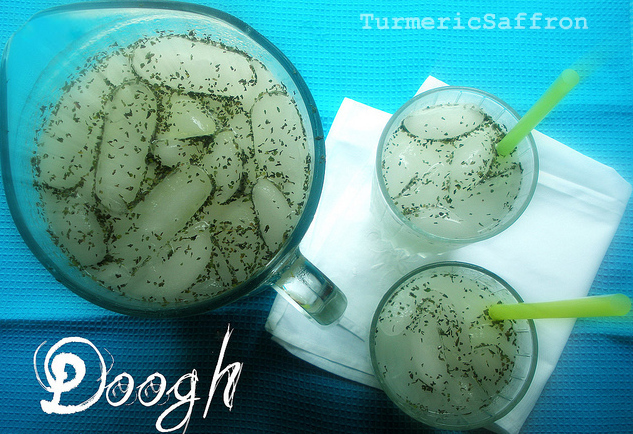 However, another variation is to add club soda instead of water for a tastier doogh. Yogurt soda is usually served with any kind of kabab dishes, any chicken and meat meals or just served as a cooling and healthy drink. The best kind of yogurt soda is a homemade one where you can adjust the amount of club soda, salt and yogurt to your liking. I find the store bought doogh somewhat harsh and hard to swallow. This is very easy and takes little time and effort to make. I like to add almost equal parts of both yogurt and water, considering that the added ice will melt quickly, especially in hot weather, therefore it will dilute the content. Gradually combine yogurt and water. Mix well using a hand mixer, blender or a whisk. 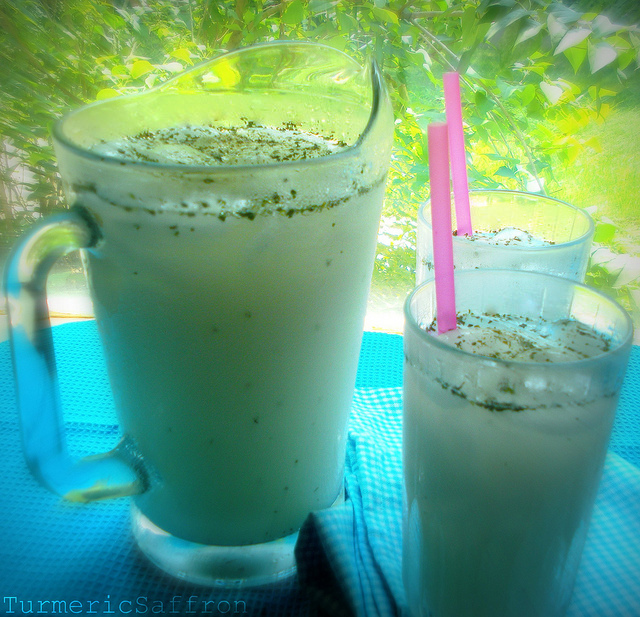 Add salt to taste, dried mint and ice cubes, stir till it blends well. 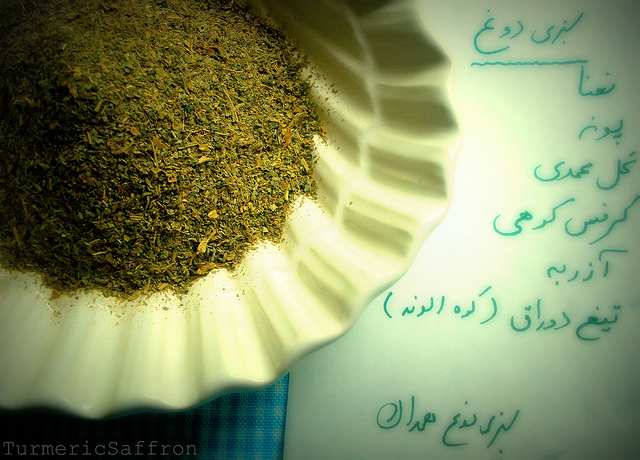 ماست وخرفه/ بورانی خرفه Mast o Khorfeh Yogurt with Purslane is healthy and very helpful to beat the summer heat. 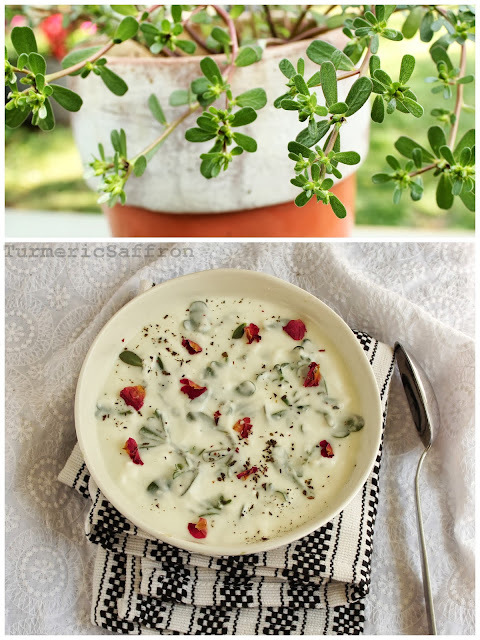 There's nothing more refreshing and satisfying than a cool cup of yogurt mixed in with coarsely chopped fresh purslane picked right from your own garden. I've never planted purslane since they grow on their own and are actually considered weeds. 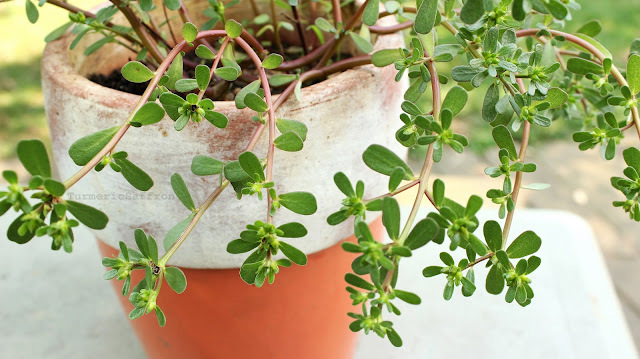 I used to pull them out and discard them, until one summer that my mother came to visit us at our new home and she had discovered purslane in the vegetable garden. I knew they looked familiar from back home but since I didn't plant them in my garden I was hesitant to eat them. But when my mother handed me a bunch of purslane and said to make a mast-o-khorfeh for lunch, I made it and loved the taste and the texture of it. That summer we got to have purslane with yogurt, mixed in with salads or simply added to the vegetable platter (sabzi khordan). Ever since then, I look for them in our garden during the summer and we don't use any pesticides in order to try and grow everything healthy and safe for consumption. However, it seems that more and more people are discovering the health benefits and the nutritional values of purslane. They are known as a source of Omega 3 fatty acids and antioxidants, vitamin C and E.
Transfer into a serving bowl, cover and chill in the refrigerator for at least an hour or until ready to serve. Serve cold with warm bread. Variation: Purslane may be added to Yogurt and Cucumber (Mast-o-Khiar) , Salad Shirazi and the platter of Sabzi Khordan.